This was a great wedding at one of my favorite wedding locations on Maui. Congratulations to the bride and groom on their amazing Maui wedding! Congratulations to Carrie and Cuong on their amazing Maui wedding at the Marriott Wailea! They had an epic day with a great team of vendors. a gorgeous wedding. All the best to our bride and groom! Mahalo for having us be your wedding film makers! Planning a destination wedding in Maui was definitely worth all of the craziness I went through to get every little detail. Being from the mainland, my husband and I researched many videographers’ websites to find the perfect company to capture our special day. 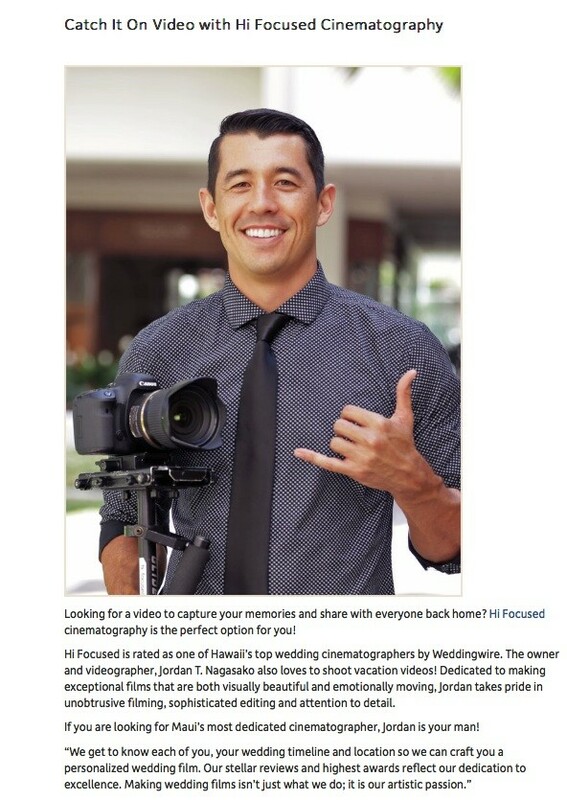 We came across HI Focused mainly from googling best videographers in Maui. I also have a friend that worked at theknot.com and she suggested I look there. HI Focused was rated 5 stars so I took a shot and contacted them. Jordan was awesome and willing to work with us to get everything we wanted captured on our wedding day. He has an amazing team and they were all very detailed in every shot they took. Our wedding video was beautiful!!! I received so many compliments on the gorgeous shots and how emotional it made everyone feel when watching it. Definitely a tear jerker. If you’re looking for top notch, Jordan and his team are the best! We have the honor of being featured as one of Maui’s top videographers on the Exotic Estates Blog! An amazing wedding at one of my favorite wedding venues on Maui. Congratulations to the bride and groom on their epic day! Mahalo for having us be your cinematographers! Here’s their 5 Star Review from The Knot. Hi Focused is the best when it comes to capturing your special day! It is so fun to watch our wedding day over and over again and being able to relive that day. Jordan and his staff are very professional and make you feel very comfortable!! They also give you pointers when capturing moments so that they get the right shot. I highly recommend Hi Focused if you are considering a videographer 🙂 We especially love the drone shots that give an aerial view of your wedding!!!! It was a blast being the videographer for this fun and beautiful wedding! gorgeous Makena Beach & Golf Resort. It’s one of my favorite hotel wedding venues. Congratulations to Krystal and Matt. This was a gorgeous wedding day! Shot at one of my favorite locations on Maui, Sugarman Estate. Congratulations Mia and R.J.! Mahalo for having us be your wedding videographer! Here’s the couple’s great 5 star review! A beautiful, fun and elegant Maui wedding! Here’s the couple’s great review of us! A beautiful Maui wedding at one of my favorite wedding venues! this amazing wedding, you can see why! Congratulations to our bride and groom on their Maui wedding! Congratulations to Dustin & Julina on getting married at the beautiful Sugarman Estate! Thanks for having us be your wedding Maui wedding videographers! Here’s their awesome 5 star review! “Jordan and his team did an excellent job for us from beginning to end. We had multiple phone calls to discuss video shots, angles, pricing, availability, etc. I was fully informed every step of the way. The day of the wedding was extremely warm but Jordan and his team showed up early and was shooting exactly on time. They got all the beauty shots we wanted but the key shot I hired Jordan for was the drone shot. They pulled it off and it looks amazing. Every person that saw the finished product from Jordan thought it was the best wedding video they’d ever seen. I have to agree!! (See Julina & Dustin video) It took Jordan about 6-7 weeks to deliver the first cut, which I consider faster than normal but more importantly, his quality was amazing. I did request a couple edits and Jordan was extremely fast and flexible. I work in the marketing field and have scripted and managed the creative portion of making a video. I’ve also managed events and know the difference between a good videographer and a great one. Jordan is professional and extremely competent, someone who would definitely make your wedding memories very special. We relive that special day because he made us a beautiful video. Price wise, he’s competitive.